Cellular signal boosters should be part of every home and office. After all, about 90% of people spend at least part of the day in an area with bad cell reception, and the cell phone is the #1 way most of us communicate. I think one of the reasons people don’t buy cell boosters as much as they should is that they don’t understand how they work. I know a lot of people think that a cell booster couldn’t possibly work as well as we say, or that it’s some sort of special technology. A big part of a cell booster is the receiving antenna. While it’s almost always placed outside the house, small apartment boosters like the second-generation weBoost eqo sit in a window and receive the signal. If you’re going to boost a large area, though, you do need an outside antenna. The outside antenna (shown in orange on the home) is not only larger than the antenna in your phone — usually a foot or so in size — but it’s placed high up where there’s less interference from trees and buildings. This gives you the best chance of getting all the signal that’s available. Most people don’t know that as much as 70% of a signal is lost when it goes into your home, so having that outdoor antenna is key. The amplifier (shown in blue-green in the home) takes a weak signal and amplifies it as much as 10,000,000 times so that it is strong enough to travel through a wire to a broadcasting antenna. The amplifier also monitors the signal to make sure there’s no chance of feedback, and automatically reduces power if there’s a problem. Finally, an indoor antenna broadcasts the stronger signal to your phone. The same antenna (shown in purple) receives the signal back from your phone — after all it wouldn’t help much if you could hear the other person but still couldn’t talk. Because the indoor antenna is so much closer to your phone than a cell site is, the signal from your phone in nice and strong. The signal from your phone goes through the amplifier and is transmitted through the outdoor antenna to the cell site. Again, because the outdoor antenna is up high, a stronger signal gets to the cell site. The amazing thing about cell boosters is that this all happens so quickly that you can’t even tell it’s going on. There’s no lag or echo in a cell booster and the only effect you get is crystal clear calls and fast data. You’ll find cell boosters from the largest to the smallest at SolidSignal.com. There are choices for your car, truck, or RV, for a small home or office, or you can choose a system that will cover up to 60,000 square feet. 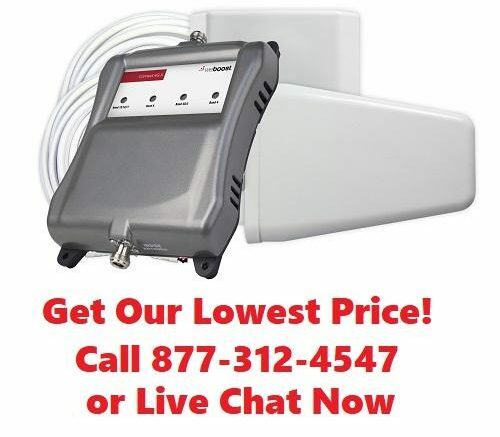 Best of all, you can get the help you need in choosing a signal booster by calling us at 877.312.4547 or choosing the live chat option on our site! A cell booster for your apartment?